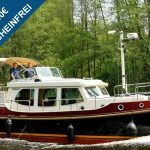 We offer you an optimal winter berth for your yacht or your boat in Mecklenburg. On our large open space of approx. 5000m² you can win over 100 yachts a year. We also have the possibility to have your yacht moored in our booth. Winter-trailers can use our slip- service. With our crane, yachts with max. 15t and 15m length, you do not need your own slip truck. Our modern lifting tractors ensure safe and uncomplicated transport from the crane to the final storage location. The winter berth of the boats at the end of the season runs from 1 October until 1 December. 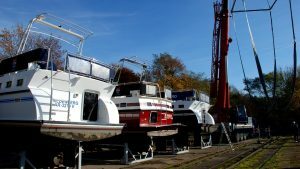 After the delivery of your boat, we start with the tipping. After the complete cleaning of the boat hull (on request), we place your boat on a solid bearing block. Alternatively, we also offer a drop-off on your own trailer. Use our clearing service for the winter to prevent possible moisture damage and mold formation. Cushions and cushions can be stored in a well-tempered area until the new season begins. The bottoming of the boats begins approximately from March 1st. Your own boat should be picked up again until May 1st. Our boat service for your new season will be a pleasure. A yachting trip into the coming summer is now nothing more in the way!